Let the Christmas reading commence! Some years I have a ton of holiday themed books (like this year) and other years I stretch my ‘scary reads’ from September to January. But this year I have had a lot of Christmas reading come my way and I can’t tell you how excited I am about that! 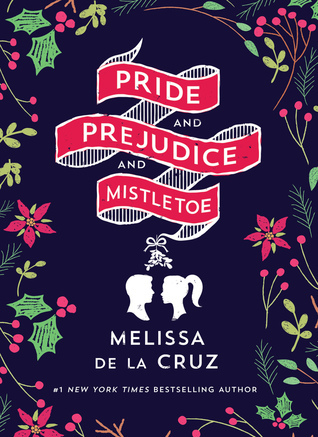 While this book has a nod to the classic Jane Austen novel, Pride and Prejudice, it is a modern retelling rather than a Regency retelling. Darcy Fitzwilliam is 29, beautiful, successful, and brilliant. She dates hedge funders and basketball stars and is never without her three cellphones—one for work, one for play, and one to throw at her assistant (just kidding). Darcy’s never fallen in love, never has time for anyone else’s drama, and never goes home for Christmas if she can help it. But when her mother falls ill, she comes home to Pemberley, Ohio, to spend the season with her dad and little brother. Her parents throw their annual Christmas bash, where she meets one Luke Bennet, the smart, sardonic slacker son of their neighbor. Luke is 32 and has never left home. He’s a carpenter and makes beautiful furniture, and is content with his simple life. He comes from a family of five brothers, each one less ambitious than the other. When Darcy and Luke fall into bed after too many eggnogs, Darcy thinks it’s just another one night stand. But why can’t she stop thinking of Luke? What is it about him? And can she fall in love, or will her pride and his prejudice against big-city girls stand in their way? (Summary from Goodreads). This book takes a classic romantic troupe and swaps gender identity and roles to create a modern take on romance. I wasn’t sure that this was going to work for me. I like classic romantic troupes and literature way to much. I’m an old fashion, traditional kind of girl, however there were great reviews of this novel on Goodreads so I thought why not? Darcy was, in my mind, kind of the classic millennial heroine. She has it all….big job, financial freedom, good looks….everything. She’s what the modern woman aspires to but she has never found true love. In many ways for me she is a sympathetic character. I am not a millennial and I feel sorry for this generation of young women who are expected to have everything because they end up sacrificing so much and that’s kind of how Darcy is when it comes to love. I think she will appeal to many modern readers. Luke on the other hand is this kind of simple guy who doesn’t want to need anything but his carpentry business. His life is relatively free from drama. When he meets Darcy one things leads to another and it doesn’t have a false ring to it at all. It’s clearly more than just too many eggnogs and I was surprised at the realness of their ‘one night stand’. It was an easy jump from intoxication and desire to love and romance. I never felt cheated out of any romance just because the gender roles were reversed from the classic Austen style. I enjoyed watching Darcy and Luke fall in love in a new and unexpected way that was also eerily familiar from the classic novel from which the inspiration comes. I loved how the Christmas spirit was incorporated into the book, though it wasn’t necessary to the storyline and plot, but it was a nice addition all the same. If you are a fan of the original Pride and Prejudice, then I think you will like this one. I was surprised with how much I liked it…..it was much more entertaining than I was anticipating!